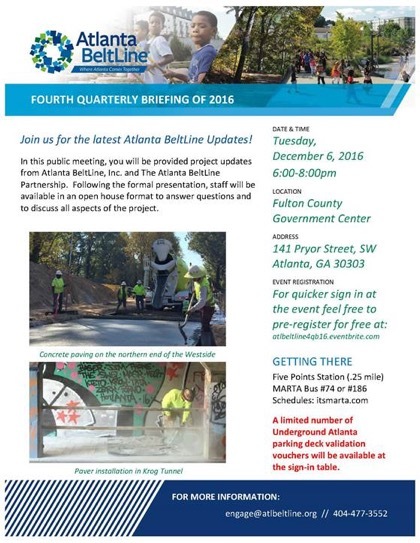 The folks at the Atlanta BeltLine invite you to join them at the upcoming Atlanta Beltline Fourth Quarterly Briefing of 2016 on December 6. Please pass the word along to your family and friends and encourage anyone who wants to hear about the latest Atlanta BeltLine developments to attend. In this public meeting, you will be provided project updates from Atlanta BeltLine, Inc. and The Atlanta BeltLine Partnership. Following the formal presentation, staff will be available in an open house format to answer questions and to discuss all aspects of the project. A limited number of Underground Atlanta parking deck validation vouchers will be available at the sign-in table.